A tail told back to front. 8 Lives is a very small rescue based in Sheffield S8, and aiming to offer help predominantly, though not exclusively, to cats in the local area. Our name therefore reflects our post code, but also the fact that the cats and kittens who come to us have already lost one of their 9 lives. 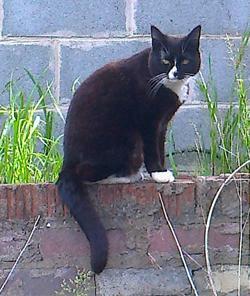 We rehome cats throughout Sheffield and surrounding areas, sometimes further afield for "more difficult to place" cats. We always homecheck prior to adoption and ask a minimum adoption fee so that we can help the next poor furry soul who comes to us. This year we are delighted to announce that we became a Registered Charity. We have a committee, a constitution and accounting system and are recognised by HMRC as a charity for tax purposes. Our precious only cat Midgecat died in September 2010. 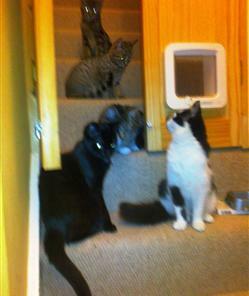 After that we couldn't bear to be without cats but equally couldn't bear to think about going to choose another cat. So we fostered for several cat rescues for about 3 years. We didn't set out to become a rescue in our own right - just to have a couple of resident cats and the odd foster cat in the designated "cat room". Three years later when 8 Lives was established, we had 6 permanent residents, the foster cats had the "cat room", plus the room formerly known as "my study" and at busy times had also taken over my bedroom. Six years on (2016) the notion of study and spare bedroom is just a fond memory, and the conservatory and lounge are in question much of the time. It began one rainy Sunday lunch time in November 2001. A young tabby cat walked into our back yard, looked through the window and whispered "I'm lost". Minutes later she'd moved in, and days later had completely taken over our lives. Finally in September 2010 she broke my heart when I had to say goodbye for the last time.